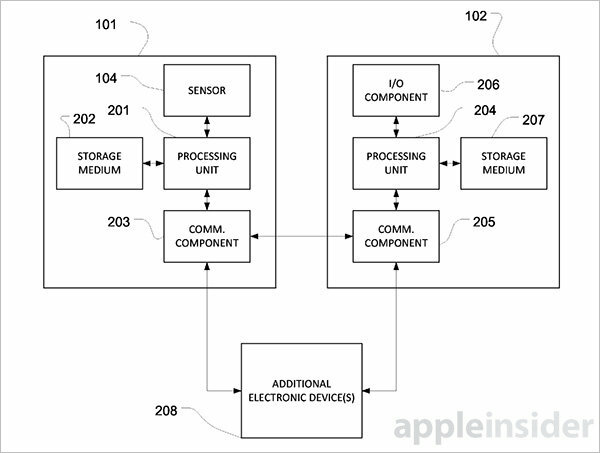 A trio of Apple patent filings relating to biometric input devices could reveal plans for a remote control, potentially destined for Apple TV, capable of distinguishing multiple users for association with custom profiles on a second device. Published by the U.S. Patent and Trademark Office on Thursday, Apple's three applications are variations (1, 2, 3) on a biometric theme. Each mentions a device capable of collecting biometric information from a user, associating that data to a profile and remotely configuring a second device based on that information. Apple has filed for numerous inventions touching on biometric-based user profiles, but today's applications are some of the first to incorporate claims intertwining such technology with a remotely controlled device. A television or set-top box is specifically employed as an example application in all three patents. And while Apple is quick to note the TV metaphor is meant only to illustrate its invention, the idea of a fingerprint reading remote control capable of seamlessly switching user preferences is perhaps the filings' most enticing application. Each document has at its core a device with biometric sensing capabilities sensitive enough to positively identify a user or multiple users. Suitable sensors range from fingerprint scanners and cameras for facial recognition to retinal scanners and algorithms for deciphering voice prints. 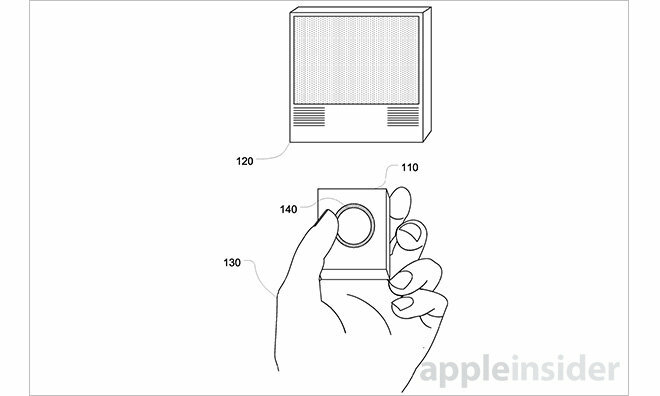 Apple describes the biometric device as a dedicated remote control, though the invention also accommodates iPhones, current models of which sport Touch ID hardware. In such cases implementation would likely only require a software update as Apple's Remote iOS app is already capable of connecting with and controlling Apple TV. In practice, a user interacts with the device in question to activate a profile on a second, remotely controlled device. Depending on sensor positioning, this process can happen naturally without much in the way of user interaction. For example, a fingerprint sensor might be disposed beneath a system power button, meaning the user would need only to pick up the remote and turn their TV on to load a preset configuration. Along with usual system settings like favorite channels, brightness and contrast, volume controls and others, the invention supports multi-user access to certain functions. As an example, a husband and wife may have different app and channel settings, as well as files that are stored locally but accessed separately. Personalized profiles might also be used to aid in content discovery and per-user purchasing, much like Touch ID and Apple's digital storefronts. One of the more interesting applications deals with restrictions for children. Current Apple products, including Apple TV, have parental controls built in, but these settings must be toggled on and off with a passcode. By implementing fingerprint sensing, the system could be provisioned to restrict children from watching mature content without express biometric authorization from an adult. In other examples, of which there are many in today's patent triad, a single user can provision multiple configurations to be accessed with different fingerprints or fingerprint sequences. Multiple users may also hide personal files protected behind their biometric identifier. As with all Apple patent applications, it remains unclear if the company actually plans to ship a biometric-capable remote or something like it. According to recent rumors, however, Apple is set to launch an all-new remote with built-in touchpad alongside an expected Apple TV hardware refresh, a prime time to introduce Touch ID to the set-top streamer. Exactly when that revision is due is widely debated, though some reports point to a release this fall. All three patent applications were filed for on the same day in January 2014 and credit Michael DiVincent, Nicole J. Hollopeter and Ruben Caballero as inventors.